Over on Let's Craft and Create we're starting off 2013 with a challenge we're sure you'll all enjoy - Anything Goes. A nice and simple one to ease us back into crafting after the Christmas break, I know I needed it! I got a lovely surprise gift pop through the letterbox on Monday. A set of Clearly Besotted Stamps. It's one of the new releases 'Flower Arrangement . I've used it on this card together with my current favourite paper pad - Basic Grey Lucille. There's some fabulous makes over on the Blog to get you insipred to join in with us. And, as it's the new year we have a very special giveaway A matching die and stamp set from Clearly Besotted Stamps, all the details you need to enter are HERE. A very gorgeous card Vicky. Loving the bow. A beautiful card Vicky, love the design. So feminine and beautiful! Love it! Lovely Spring colours Vicky. I've been looking out for that Lucille paper too - its very nice as are the stamps. 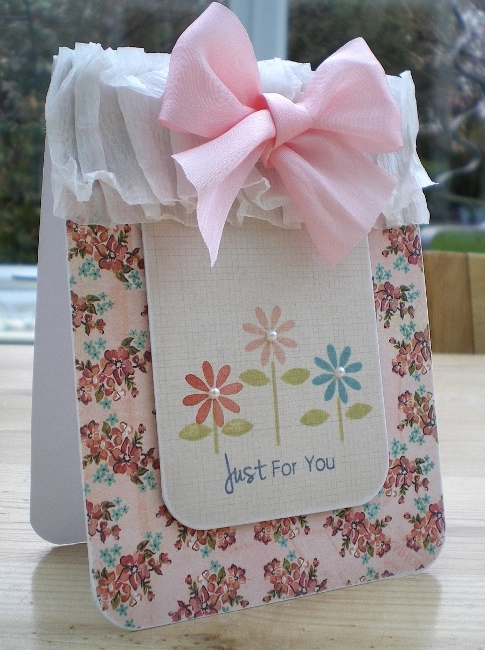 Hi Vicky, I'm Sarah from Making-Handmade-Cards.com. This is a very lovely card, Vicky. I love the floral background and the ribbons and the flowers are just beautiful - really gorgeous! By the way, I was wondering if you got our email about our Design Team invitation? It would be fabulous to have you in our team - we would love to see more of your creativity being unleashed with our eKits! Please do let me know, ok?